OS/400 Operations Navigator is the graphical interface to manage your IBM eServer iSeries runtime environment. V5R1 Operations Navigator contains major function and interface enhancements over previous releases. This IBM Redbooks publication presents an overview of all V5R1 Operations Navigator functions. 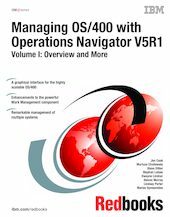 It is the first volume in the "Managing OS/400 with Operations Navigator V5R1" series. The key enhancements include a new Work Management component; new job, message, and B2B activity monitors; and new graph history for viewing performance data. It also includes new and updated interfaces to networking capabilities like Quality of Service, Virtual Private Network, TCP/IP configuration and connection verification utilities. And it includes new and improved multiple system management of system values and user and group profiles. V5R1 Operations Navigator has also improved Windows operating systems administration and the online help. This volume focuses on installation and function navigation, and provides an overview of all V5R1 Operations Navigator functions. It also provides details on specific Operations Navigator components, most of which are essential to understanding the functions described in the other volumes of this book volume set.